Four-year-old Anderson was the flower girl at her mother's (Michelle Hall) wedding but wanted to be just like her mom and be a bride, too. 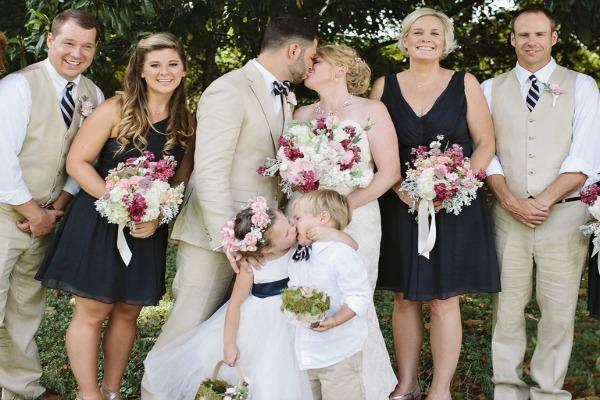 Dressed in bride white, little Anderson surprised the entire wedding party when she gave the ringbearer, Ike, a big kiss. "I set up the entire wedding party for a formal shot as I do with every wedding, and then asked the bride and groom to kiss," photographer Leah Bullard told The Huffington Post. "Since Anderson had been calling herself the bride the whole day, she assumed I was referring to her and went in for a kiss too. It was a memorable moment that had everyone in tears laughing." Anderson planted a big smooch on Ike. The kiss was extra special not only to the wedding party who all look surprised and delighted, but to Bullard as well. "I strive to capture the moment of the day, so for me to be able to capture that moment, that's a moment the families can look back on for years to come and laugh and relive it over again," Bullard said. It's good to know that Anderson will probably grow up to be a strong, assertive woman who, when she wants a kiss, won't be afraid to take it.